Midven currently manages a range of funds representing in excess of £110m under management. Each of the funds has specific investment criteria but share the commonality of all being focused on early stage and SME businesses. Click on each of the funds below to find out more. The £35m MEIF West Midlands Equity Fund is part of the wider Midlands Engine Investment Fund established by the British Business Bank, funding for which is drawn from several sources including UK Government, the European Investment Bank, the British Business Bank and the European Regional Development Fund and the 9 LEPs that are part of the Midlands Engine, plus the South East Midlands LEP. The West Midlands Equity Fund will provide equity funding of up to £2m to businesses with high growth potential located within the six West Midlands LEP regions. A £5m fund enabling investors to build a portfolio of investments with the potential for attractive returns and tax relief benefits, by focusing on the UKs buoyant second city and wider region. Created in 2002, the UKI2S (formerly known as The Rainbow Seed Fund) is a £27.1m early-stage venture capital fund that builds and grows technology companies stemming from the UK’s research base. The fund helps build companies from great science developed in public laboratories, science and technology campuses and synthetic biology. 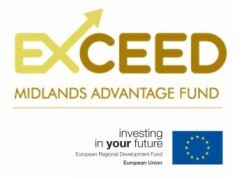 Note: This fund is not open to new investments.The Exceed Partnership fund was launched in March 2010 to provide expansion and development capital to West Midlands based businesses. The £18.4m fund is targeting businesses across a broad range of sectors with the potential to deliver high levels of growth and profitability. Note: This fund is not open to new investments. The Early Advantage fund was launched In December 2009 to provide investment, alongside business angels and other private sector investors, in early stage and small businesses within the West Midlands. The fund amount has increased to £10m. Stephenson LP is a co-investment fund established in 2014 with funding provided by the Institution of Mechanical Engineers. Harwell Capital is an overseas private investor network offering investors the opportunity to invest directly in high growth technology companies. This represents an additional and alternative source of funding, available through Midven, for UK technology companies located throughout the country. Midven seeks out and meets appropriate technology investment opportunities for Harwell, introduces them to Harwell, transacts the investment on Harwell’s behalf and then works with the company post-investment to help them achieve their growth targets. Note: This fund is now closed. The Advantage Growth fund is a £17.5m fund established in 2003 as part of the UK government Regional Venture Capital Fund Initiative. The fund invests in West Midlands based small and medium-sized enterprises. Note: This fund is now closed. The HSBC Enterprise fund was established in July 1997 by the merger of separate HSBC sponsored funds for the East and West Midlands to create a £6.4m fund.